The Singer 404a. This is the same model sewing machine that I learned to sew on many years ago. It was my Mom's machine and served us well for several years. We are both staunch Bernina fans and I am dazzled by all the functionality of my Bernina 790. 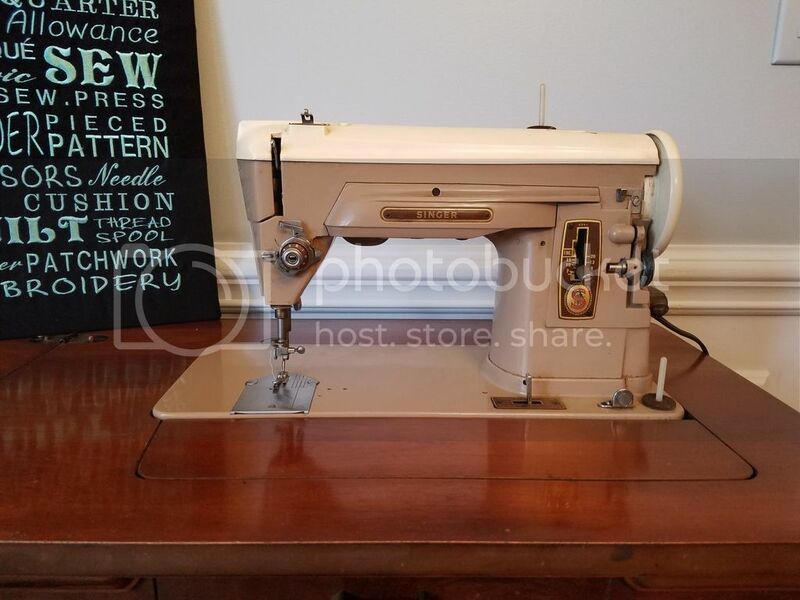 Last year something caused me to reminisce about my sewing beginnings and I started hunting for this model, found a fabulous deal online and pressed my husband to get it for me. It was a thrill to turn it on and hear how it sounded. It seems that I'm late to the party when it comes to buying old sewing machines. In talking to customers and coworkers at the quilt shop, the phrase, "Oh yes, I have 13 machines" rolls off the tongue of many without hesitation. THIRTEEN? After I ponder the amount of storage they must have to own this many, I wonder about the stories of these machines, the history, the thrill of the hunt, etc. Now I must admit that I've been surfing online sales again.... How many machines do you own? Which one is your favorite, your traveler, your dust collector? A nice 221 with case and a load of accessories, plus a card table that I never use. A crunchy rescue 221 with no accessories that I use often. A 301A two-tone short-bed in a spinet cabinet that has seen a ton of use. A 301A taupe long-bed that sees very little use. And lastly, the 15-90 rescue that started it all.